I was asked to review the cocktail book ‘Handcrafted Cocktails – The Mixologist’s Guide to Classic Drinks for Morning, Noon and Night‘ by Molly Wellmann. I’m always eager to be inspired and learn more about the art of crafting cocktails so I took the bait and I’m glad I did. It’s a small book that is just packed with information and great recipes, well…I’m assuming great recipes if the first drink I spied that took my fancy is any measure. The book opened to this recipe for a Kitty Burke, it looked so refreshing on what was a hot day in Denver and I spied in the middle of the page a reference to the St. Louis Cardinals and I was done. I’m from St. Louis and no matter how long I’ve been gone or how far away I may be I will forever be a Cardinals fan. This drink was getting made; it did not hurt that it included Gin, Triple Sec, Cucumber and Mint; sounded fantastic. Molly resides in Cincinnati and brings a world of experience to this endeavor. She is the co-owner of multiple bars in Cincinnati and was voted best mixologist/bartender in the city for three consecutive years; this girl has chops! 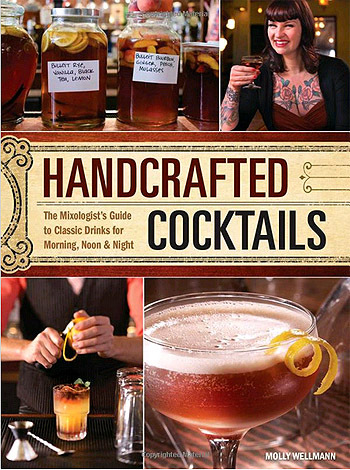 The book includes chapters that provide basics for Bartending Tools and Techniques and another that discusses Spirits and Handcrafted Mixers but the best part is how she separates the remaining chapters of the book into sections for illuminating cocktails basically on the consideration of what time of the day they are best suited for. How convenient! In Drinks for the Morning there are hangover cures, pretty pink concoctions and more meant for a breakfast or brunch occasion. Additional chapters follow with Drinks for the Afternoon, Happy Hour Drinks, Drinks with Dinner and After Dinner Drinks. The Kitty Burke is in Chapter 4: Drinks for the Afternoon. Don’t you love that…no longer resigned to having to wait until 5pm! The ingredients all contribute to such a light and totally refreshing beverage…some gin, orange flower water, mint and cucumber…makes you thirsty just thinking about it, huh? I also noticed some familiar names in this chapter like the Mint Julep and Pisco Punch but I’m more excited about those I have yet to discover; the Koala cocktail might have to be tried soon; I’m absolutely enthralled about a cocktail that uses eucalyptus simple syrup! I’ve got so many cocktails I want to make and guess what? One of my readers will be given this same book to make them too! If you’re ready to get your ‘cocktail on’ all you have to do is leave a comment; let’s see…how about you tell me what your favorite cocktail is; just because I’m curious! Really it’s that simple; jump to after the recipe for the Rules. 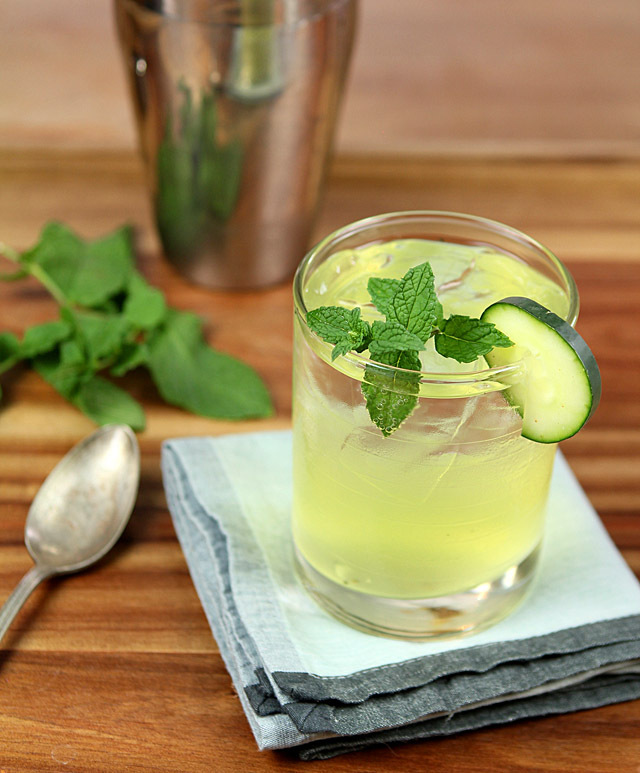 In a cocktail shaker, muddle the cucumber and mint leaves. Add the gin, triple sec and orange blossom water. Add ice, shake and strain into an ice filled old fashioned glass. Top with soda and gently stir. 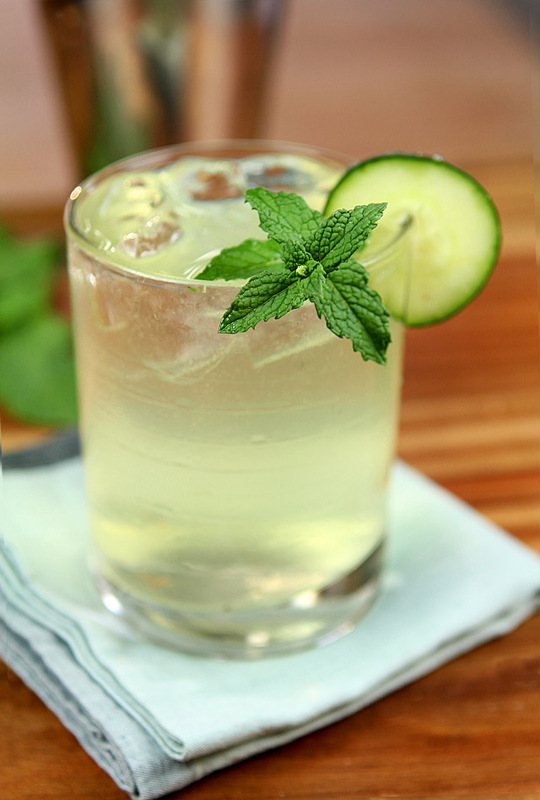 Garnish with a sprig of mint and a cucumber wheel. I heard about this cocktail on “Dinner Party Download” (May 26, 2017 broadcast; dinnerpartydownload.org). I don’t drink liquor alot, but I’m a bit intrigued by this drink and the story behind it, so I might have to give it a try! I enjoy a good mai tai! I have been having so much fun making new concoctions with my husband and would LOVE this book! My favorite is a tasty whiskey old fashioned sour muddled with fresh fruit. Yum! I stil love a classic lemon drop martini…refreshing on any day. Would love to discover something new, though. The Kitty Burke is now on my list of cocktails to try. Will be Pinning this! I am a big fan of the Oaks Lily, a delicious mix of vodka, sour mix (we just use fresh lemon juice), cranberry juice, and triple sec. It’s the Official Drink of the Kentucky Oaks, which is the big fillies race the day before the Kentucky Derby. I have already been following you on twitter! My all time favorite cocktail is a frozen peach bellini! Light , fruity and easy to drink! It makes you feel pampered. I love, love, love, a good brandy old fashioned. I’ve not heard of this cocktail, and it looks totally delish. Of course I have all the ingredients, so I’ll have to give it a try. My usual triple sec is Cointreau, and I’ve not used Citronge – should I be using that instead in your opinion? Anyway, pinning down my favorite cocktail is touch! Probably during warm weather it’s the Classic Daiquiri (lately I’ve been making them with 2 parts white rum to 1 part lime juice, maybe a teaspoon of simple syrup). When it colder, the Sidecar is my fave. And a Mai-Tai is always welcome! But really it’s whatever I happen to be drinking at that moment. 😉 Fun post – thanks. I don’t object to any of them that use real orange essence; as long as it’s not just artificial flavor and sugar, I think they all work about the same John. This does look refreshing indeed. I’m sure if you substitute the triple sec with limoncello the cocktail’s name then becomes the Barbie K. It could be! Basil Briar Martini created by Anna at the Greenbriar in Coeur d’Alene, Idaho. Muddled basil, simple syrup, vodka, fresh lime, and the retro surprise, a splash of Galliano. Delicious! What a jewel of a book, and those who know me know I love my cocktails! My personal favorite is surely the Hanky Panky, equal parts gin and Italian vermouth with a few drops of Fernet Branca, and an orange twist, it is heaven on earth. And about that 5:00 rule, in my view, it is always 5:00 someehere in the world. Another great cocktail– do you know when I saw your post this morning I was surprised it was Friday already? The start of school makes for a hectic time here but am I ever glad to reach Friday! The cocktail I turn to is gin and tonic…mainly because it is simple and easy enough that I don’t worry about messing up the ingredients. Looks like this book would help me branch out a bit! My cocktail tastes are pretty simple – a good Cosmo or a rum, coke and lime. However, I just read a book where the main character drinks “French martinis”, which are vodka, raspberry liqueur and pineapple juice, which sounds like it could be a new favorite. Can’t wait to try it. The book sounds great – thanks for the chance! My favorite cocktail is super simple. This is one I drink on a regular basis. Vodka, soda and a lime. Sure there are others out there that I love but as my true blue regular? The local bar tender just calls it “the Kelli” Ketel One, soda and lime. 🙂 TGIF!